Allied Wallet, a globally leading provider of mainstream online payment processing, is now compatible with SOFORT, Trustly, CaixaBankWallet, and iupay to better serve over 23 million online shoppers in Spain. Spain has embraced the online experience with over 96% of 16-44 year olds logging on daily. With a population of about 48.6 million, these are sizeable figures and there are only more signs of tremendous growth to come. Spanish internet users currently spend the most money online on fashion, travel tickets, electronics, tickets, and books/CDs. By 2022, fashion will still be the most purchased online category with an estimated value of €10.1 billion, followed by toys, hobby, and "DIY" products with an estimated value of €4.4 billion. In 2013, the Spanish government enforced the "Digital Agenda for Spain" whch strived to boost internet access and drive investments in infrastructure. This initiative could explain their high internet connectivity rates. 80% of Spain's internet users use their mobile device to access the internet and mobile commerce is expected to grow an additional 48% in the next few years. "The e-commerce growth in Spain is amazing. Three out of four people in Spain have access to the internet, and that's amazing. There are tens of millions of people and they now have access to new goods, products, and services. 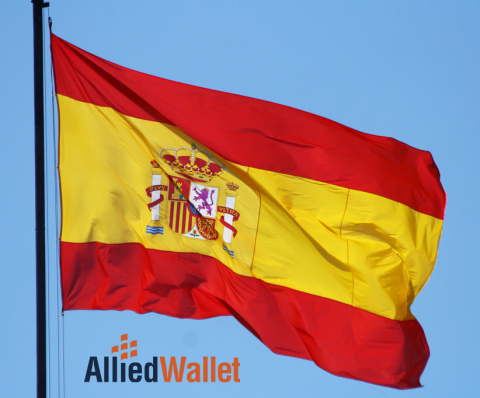 This is great, and we just want to make sure we do our part to protect that and keep online shoppers in Spain safe," said Andy Khawaja - CEO of Allied Wallet. Because of their exposure to fraud, eWallets, prepaid solutions, and direct debit are popular for online payments in Spain. These alternative payment options suit their needs and protect shoppers and merchants alike in their online shopping experience. Services like SOFORT and Trustly offer an instant bank transfer experience where users can issue payments through their bank account while being assured that these companies are protecting their transactions. SOFORT alone processes more than 4 million monthly transactions with more than 30,000 online merchants. CaixaBankWallet and iupay are eWallet services in which users can safely load their eWallet or connect their eWallet to their bank account and safely spend online with participating merchants or even in store with the respective mobile applications. CaixaBankWallet already has a 24% market share in Spain and iupay is available to customers of BBVA, Banco Santander, Banco Popular, Banco Sabadel, Bankia, CaixaBank, Caja Rural, and ING Direct by default. Spain is projected to have over 30.5 million online shoppers by 2022, creating an annual volume of €27.6 billion. Allied Wallet is proud to be compatible with all of these new solutions to connect more users globally and perpetuate the e-commerce growth in Spain. Allied Wallet continues to revolutionize the e-commerce industry by introducing new and innovative payment processing solutions for online merchants, enabling them to send and receive global payments. With PCI (News - Alert) compliant merchant services for nearly any business size, Allied Wallet provides a state-of-the-art payment gateway to optimize online transactions. Please visit www.alliedwallet.com/.